Lead photo: Southern Sierra in a “shoulder season” spell of winter-like conditions—daytime highs below freezing & nighttime low temps around +12 ºF. Some gear hacks (non-clothing) to keep you warm in the “shoulder season.” E.g. Tents/shelters, sleeping bags/quits that will keep you warm and protected with a minimal increase in weight over 2+ season gear. An amazing deal on a fantastic layer! A 100 wt fleece shirt is my go to favorite mid-layer—goes on every trip! Sadly it appears that 100 wt fleece shirts like this are a dying breed so it’s best to buy one now. Note that there is also a good inventory of the similar (and excellent) The North Face Men’s TKA 100 Glacier Quarter Zip on Amazon. Note: this only comes in a Men’s/Unisex version but Alison has happily used one for years and loves it. Stay warm and don’t sweat out and freeze with this innovative jacket. Admittedly expensive, this is one of the most versatile cold weather garments for active people! The new highly breathable insulation garments like the Patagonia Nano-Air Insulated Hoodie or Patagonia Nano-Air Light Hybrid Insulated Jacket are a huge stride forward in staying warm but not sweating out for active pursuits like backpacking uphill, and fast hiking. Their exceptionally breathable fabric has tons of air permeability/ventilation (put your mouth on the fabric and you can easily breathe through it) yet provides just enough wind blocking to keep you warm. This is far better than the old school fleece + shirt combo which is not breathable enough to keep you from sweating out. A great value in a high-tech layering garment currently on sale. Like the Patagonia Nano-Air the Outdoor Research Ascendant Insulated Hoodie one of the most versatile cold weather garments for active people. Outdoor Research uses Polartec Alpha fleece insulation vs. microfiber synthetic on the Nano-Air. This saves weight by not needing an inner fabric layer, and will dry quicker as well. Like the Nano-Air it does an excellent job of providing the perfect balance of breathability, wind resistance and warmth for high exertion activities in cold weather. We also like that it comes with a full complement of pockets, two hand and one zippered chest. $150 to $220 on sale/closeout at REI – buy early to get the size you want. In cold weather do try to “Minimize stops to essential needs, and don’t make them longer than necessary. You get cold quickly, and it takes a long time to warm up again. If you’re starting to chill it’s time to move.” But “If you really need to stop for a longer time (over 5 minutes), try to do it in a warmer, more protected area and put on warm down jacket as soon as you stop. Take your it just before you start hiking again, or even after you been walking for a few minutes. REI Co-op Magma 850 Down Hoodie is great value in a very warm ultralight jacket. The REI Magma 850 down jacket offers easy movement and just-right warmth for backpacking, hiking and travel. This jacket is a favorite of ours and a great deal at $219 but when it’s on sale it’s a steal, especially compared to competitors jackets than can run $300 or higher. The Magma 850 Hoodie has all the features you want in a down jacket — the lightest high fill power water resistant goose down, a hood critical to increasing warmth, a durable Pertex® ripstop shell, well articulated shoulders for free range of motion, and variable baffles that provide warmth where it’s needed and reduced bulk where it’s not. Finally it has pockets that aren’t blocked by a pack hipbelt, a gripe we have with a lot of jackets. For those who can’t handle wool look at $45 REI 1/2-Zip Active Shirt. People bring too many layers as well as the wrong layers. This costs a lot of money and it’s heavy. Try to find a minimal set of light clothing that will work in a broad range of conditions. It can be done! A good layering system is NOT about frequently changing layers. Quite the opposite, you should strive to minimize adding or removing layers! A single set of well-selected clothes should work in a broad range of temperatures (e.g. from mid-20s °F to around 50 °F) without adding or removing layers. Keep Hiking When It’s Cold. Frequent stops to change layers can seriously chill you. And once chilled it can be exceptionally hard to get warm again. (In cold weather, constant but moderate movement is what keeps you warm.) Minimize stops to essential needs, and don’t make them longer than necessary. If you really need to stop for a longer time (over 5 minutes), try to do it in a warmer, more protected area and put on warm clothing (e.g. down jacket) as soon as you stop. Take your warm clothing off just before you start hiking again. Or even after you been walking for a few minutes. Finally, leave your shorts and short sleeved shirts at home. Long pants and long sleeved shirts are far better and more practical at protecting you from brush, sun, and disease carrying insects than sunscreen and insect repellents. [Note: this year will be a bad one for Lyme. See Best Ways to Protect Yourself from Lyme and Zika While Hiking]. 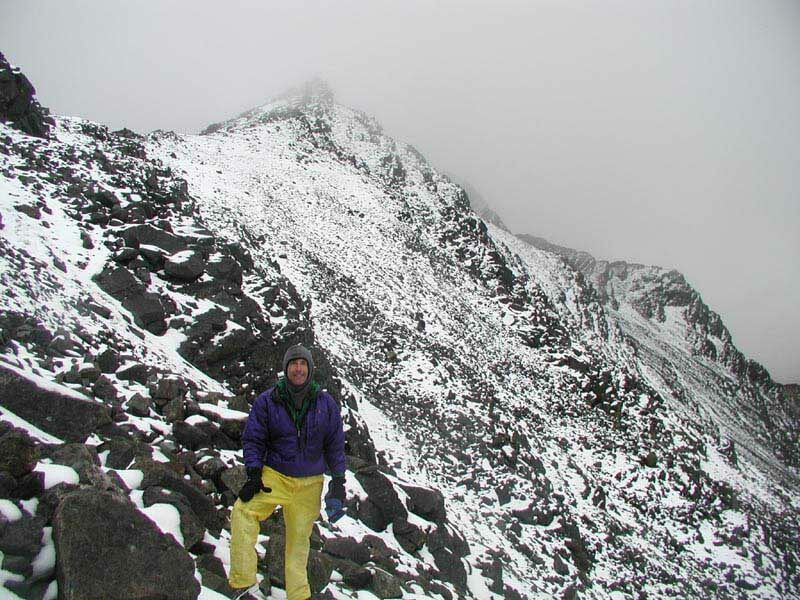 A single set of clothes for the entire day: Here I am in late winter conditions at around 4,000 ft on the Appalachian Trail. It’s windy and about 25 degrees. But I’m warm and comfortable hiking at my own pace wearing just a 6 oz base layer, a 7 oz fleece shirt (mid-layer) , a 2 oz fleece hat, and 2 oz gloves. I can hike in this outfit from the mid-20s °F to around 50 °F – going up and down hill without needing to stop for a clothing change. Why Use a Layering System? A layering system is really just a set of good hiking clothes. It is supposed to keep you safe and comfortable in a broad range of temperatures and environmental conditions (wind, rain, sleet and snow). The layering system is most useful for cold weather (in warm weather, a light top and bottom usually suffice). Ideally, this layering system should be simple, light and inexpensive. The following layering system is slightly tuned towards cooler temperatures of the high mountains, or early spring and late fall at lower elevations (e.g. March on the Appalachian trail). But I’ve also added a few options in a subsequent table for warmer, more humid conditions (e.g. the Appalachian Trial mid-summer, or the tropical jungle). A light layering system while summiting in Scotland’s Highlands. I was ribbed by the Scots as “the Yank in trainers [running shoes] and yellow pants” for wearing virtually nothing given the winter conditions. Nonetheless, I summited just fine in my light running shoes and 4 oz shell pants—wearing the same clothing system without changes to the summit and back down. Note: much of the following is from my top-ranked 9 Pound, Full Comfort, Lightweight Backpacking Gear List). Take a peek at it for an integrated set of gear that won’t weigh you down and break your back. (for cold Wx) Patagonia R1 Hoodie 12.5 Think of it as “fur for humans.” possibly the most versatile cold to very cold weather base layer. It works over an astonishing range of conditions. OR Ascendant Insulated Hoodie 13.0 New highly air-permeable (super breathable) shell, synthetic fill jackets are a new alternative to fleece. More expensive and less durable they are lighter and more compressible for equivalent warmth, especially when it’s very cold and/or windy. Patagonia M10 Anorak only 8 oz! 10.9 Given that I will likely be wearing my jacket more frequently (both for rain and as a “windshirt” when cold), I favor a more breathable & durable 3-layer construction for shoulder season (SS). Outdoor Research Interstellar is my current favorite. Zpacks Vertice Rain Pants (3.6! oz) 6.0 While I might not bring them on all 2+ season trips, I DO bring rain pants in the (SS). Vertice pants are super light and crazy breathable. or Montbell Mirage (12.8 oz) 13 In very cold Wx a puffy jacket essential for warmth in camp, rest stops AND at night to supplement your down sleeping bag/quilt. FF Heilos Down Pants (13) 6.5 For colder weather. West. Mtn. pants light & warm! Helios crazy warm with side zips. MLD eVENT Rain Mitts (1.2) 1.2 Critical for keeping hands warm and dry in cold rain. Also work as great wind shells. Gloves – cold & wet conditions Showa Japanese fishing gloves 4.5 Alternative hand-wear for wet & cold. Waterproof, breathable, with grippy rubber-like shell. Brooks Cascadia Trail-Runners 18 Altra: Light, huge toe room, super comfortable! Camp footwear Feathered Friends Down Booties For those with cold feet. Put on with dry socks as soon as you get into camp! Cold hands and feet Chemical hand warmer and foot warmer packets Critical re-warming contingency/backup for hands and feet in case you blow it and get them too cold to warm up again on their own. * Note: You only need one! Extra shirts, pants (and base-layers) are a poor choice to stay warm. And you only need single 6-12 oz fleece/wool mid layer garment. 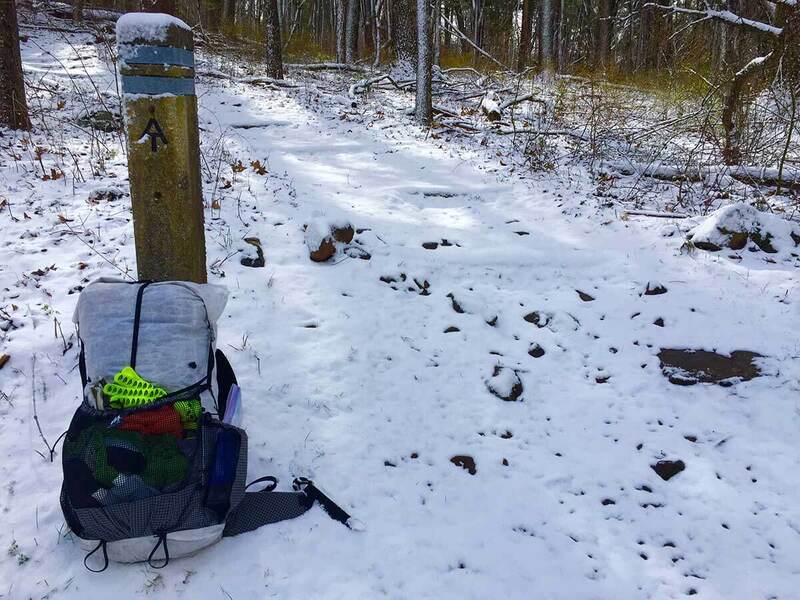 The following is excerpted from Why You Won’t Freeze or Starve Ultralight Backpacking. This gear (in combination with the clothing above) will keep you warm and protected with a minimal increase in weight over 2+ season gear. Your tent doesn’t keep you warm. The hard reality is that the temperature inside your tent, at best, will only be a few degrees warmer than the outside temperature. Your tent just keeps the wind and rain off (very important! )—but so will a tarp or pyramid shelter. What does keep you warm is a puffy down sleeping bag and jacket. Usually used in combo when it’s super cold. That is, down get you the most warmth for its weight. So get a good down jacket and a down sleeping bag or quilt vs. spending extra bucks and weight on a bomber shelter. That is the difference in weight between a 14 oz pyramid shelter and a 3+ pound tent will get you some incredible warmth in down gear and clothing! HMG Ultamid 2 Pyramid Shelter 14.0 Late season bugs non-existent. Pyramid design is light, strong, and able to withstand rain, snow and hight winds at a fraction of the weight of a tent. Super easy to setup (faster than most tents!). FF Hummingbird UL 20 (25 oz) Feathered Friends are among warmest & lightest bags. Conservatively, rated they are likely +20 and +10F respectively. Sleeping Quilt Hammock Gear Burrow Quilt +10 18.0 I add +2 oz of down (to a +20F quilt) in the top vertical baffles to bring temp rating to around +10F. Great value! ~1/2 cost of sleeping bag. Therm-a-Rest RidgeRest 1/2 pad 12.1 “Women’s” R3.9 lighter/warmer than Men’s. Best for for men too! XTherm, R5.7, is warmer & heavier. For a light, low cost hack cut Therm-a-Rest RidgeRest pad in half & put it over the top of your current pad (shoulder to knees). And as stated earlier, long pants and long sleeved shirts are far better and more practical at protecting you from brush, sun, and disease carrying insects. Chemical sunscreens and insect repellent lotions take a lot of time to correctly apply to large areas of skin. And they don’t last nearly as long as the near-lifetime* effectiveness of long pants and long sleeve shirts against bugs and sun. Note it’s going to be the worst year yet for Lyme Disease. For more detailed information on how to protect yourself see: Best Ways to Protect Yourself from Lyme and Zika While Hiking. Shirt (alt) Exofficio Bugs Away Halo Long Sleeve Shirt Men’s and Women’s Also good, widely available via Amazon and other retailers like REI. 70 wash insect repellent. Pants hiking* ExOfficio BugsAway Ziwa Pants Men’s and Women’s Available in both Men’s and Women’s. Light, cool, sun protection. 70 wash insect repellent. Pants (alt) RailRiders Men’s Eco-Mesh Pant with Insect Shield RailRiders pants have huge side vent on legs for cooling. 70 wash insect repellent. In colder weather, you can spend far too much time stopping to adjust layers. This is especially true on hilly trails where you are consistently getting sweaty and hot going uphill, and freezing while on ridges and going downhill. Moderate but consistent movement, not stopping for layer changes, is the key to keeping warm when it’s cold. Hiking to keep warm needn’t be at all tiring or strenuous. Minimize stops to essential needs, and don’t make them longer than necessary. When you stop, you get cold quickly and it takes a long time to warm up again. If you’re starting to chill it’s time to move. Temperature adjustments are made without stopping or changing a top or bottom layer. Too hot? take off hat and gloves (put in pants pockets). To further cool unzip fleece jacket and/or your base layer, and possibly push sleeves up. Too cold? reverse the procedure. I only add warmer clothing when I can no longer stay warm walking at a comfortable pace (and with a good clothing system, this is a rare). If you do need to change layers do it quickly. What most people don’t realize is how much time it takes to stop, take your pack off, put-on or take-off a layer, put your pack back on and start hiking again. It’s plenty long enough seriously to chill! If it’s extremely cold and windy, I will use my rain jacket as a windshell (note: unzipping your rain jacket all the way is a major cooling force when needed). When wearing your rain jacket pay special attention to not sweating out your clothing. Adjust and ventilate your clothing and/or slow your hiking pace as necessary. As above, it’s very easy to get clothing wet, but it takes a long time to dry it out in cold and damp weather. A Fleece Jacket is Better than a Windshirt? Note: this is for inexpensive fleece that has a much tighter weave and is far more wind resistant than more open weave, high tech fleece like Patagonia R2. As such, the fleece does an a decent job keeping wind from penetrating your clothing. BUT it is far less clammy and more breathable than a windshirt, allowing sweat to pass through your clothing and evaporate. By the time it’s cold enough and windy enough to warrant a fully windproof shell like a windshirt, my rain jacket does fine. By then it’s cold enough that condensation from the rain jacket is not a huge issue. Finally, it’s lighter. Since you’d bring a fleece layer anyway, you save the weight of a windshirt and simplify your layering system. This post contains affilate links. If you make a purchase after clicking on the these links, a slight portion of the sale helps support this site at no additional cost to you. I do not receive compensation from the companies whose products are listed. I am never under an obligation to write a review about any product. Finally, this post expresses my own independent opinion. When I give instruction to beginners I make the statement “CLOTHES AND SLEEPING BAGS ARE NOT WARM”. That is what you said in essence. Put a thermometer in a pile of clothes and it will read ambient temp. There are 5 ways a body loses heat and clothes address one or three of them. Evaporation, convection, conduction, radiation and respiration. The only SOURCE OF HEAT IS YOUR BODY releasing energy from food or drink. Protect it rather than lose it and try to get it back. You may not have availability of external heat like fire, chemical packets or another warm body. Anyone may include this version of information in whatever format they want. It is not original info but the wording may get the right attention. Forgive this novice, but why does no one seem to address the lower extremities in the 100s of “layering” articles I’ve read? Is the principle not the same? Base + Insulation + shell? Further, I seem to be unable to find a decent pair of fleece leggings or pants; what are the experts using in cold weather, i.e. < 30 F? Please enlighten me…and thanks! Hey! Thanks for your prompt reply. I will look into the gear you suggest, as well as the method. Please note that I am insanely jealous of your current geographic location! It’s been a weird winter here in NYC so far…8 F this past Tuesday, and currently 62 F and pouring rain! Tell me again how the climate’s not CHANGING!!??!! Can you recommend base layers that can be left on for those outdoors who cannot dictate how often they start and stop moving (search and rescue for example), that would auto regulate body temp? I believe the Patagonia Nano Air and similar OR Ascendant hoodies are marketed as such. Are these claims mostly true and can you recommend something similar for the legs? The muscles in the legs, filled with your warm blood are the main reason you may notice people hiking in cool weather while wearing shorts and are “layering” above the belt. A lot of heat is created and disipated through the legs working. But, yes the layering “idea” would be the same for the upper and lower body. Being a NOVICE please DO NOT follow this article. It is misleading and fails to truly explain what layerings fundimental purpose is.. YOUR BODY METABOLISM IS THE HEAT SOURCE THAT “PUSHES” THE MOISTURE (ORIGINATING FROM PERSPIRATION) OFF YOUR SKIN WHICH IS “WICKED” OFF YOUR SKIN BY THE BASE LAYER. THAT HEAT STARTS WITH WHAT YOU ATE AND TO KEEP YOU PRODUCING HEAT YOU HAVE TO EAT CALORIES. A DIFFERENTIAL FROM THE WARMTH OF YOU AND THE COLD OF THE ENVIRONMENT CREATES THE MOISTURE MOVING MACHINE AND USING FABRICS THAT ALLOW MINIMAL MOISTURE ABSORBSION (SYNTHETIC) WHILE BEING ABLE TO PASS THE MOISTURE VAPOR THROUGH THE SHELL FABRIC BUT, PREVENT LIQUID WATER FROM SOAKING THE MID AND BASE LAYERS. ALAN SHOULD HAVE DISCLOSED THIS FOR COMPLETENESS AND PROPER KNOWLEDGE. THERE ARE TOO MANY VARIABLES FOR INEXPERIENCED ADVENTURERS TO GET HURT OVER. CHOOSE SAFETY OVER LIGHTNESS THEN LET YOUR EXPERIENCES DEVELOP AND SEE WHERE IT LEADS YOU. Hi Victor. Yes, blood flowing through the legs is the reason that they need less insulation than top layers. The reason for the differential between legs and upper body is that for hiking legs are doing almost all of the work, thus they have the most blood flow and warmth. But when moving at a tempo pace, your whole body benefits from the warmth of increased blood flow. Thus the encouragement of this post to move at a tempo pace. I think this post is pretty straightforward that moderate/tempo movement is the key to warmth in cold weather. That when you are moving you are moving with just enough layers to keep you warm but not sweat out. And when you are stopped you are stopped with your warm jacket on and hopefully in a sheltered area. I think this is a fairly simple concept that most hikers and backpackers novice or not, can easily understand and execute. The only personal variance will be people determining the correct clothing for the temperature and their personal tempo pace. Again, not too difficult. If you are too cold add a layer or use a warmer garment. If you are starting to sweat and get your base layer/mid layer wet then you need to either lighten up on insulation or cut your pace. Again, I think the post addresses this. Patagonia Airshed is a much better wind shirt because it breathes better than typical wind shirts. Works well with base layer or over a light fleece+base layer combination. I really enjoy the site. It’s one of the best of its kind. One comment on layering and vests: (I see you do address vests in a few places.) As someone who has Raynaud’s, I find that a vest is one of the best pieces of kit I can add to any layering system. Core temperature is key. Paradoxically, I’m not a “cold” person; I just have this odd syndrome. Vests are great because without arms, they vent heat quickly when unzipped (so they don’t have to be removed), and they don’t add a lot of weight. I do have to keep chemical warmers in my pack no matter what. Super happy I found your blog/site with all of these details. I just wanted to clarify, if you’re hiking in cold weather, are you saying the Patagonia R1 Hoodie is your baselayer, direct to skin? Or do you have something synthetic shirt underneath to wick away sweat to the fleece? I’ll keep reading, there is a ton of info here, and thank you for passing along so many hints/tips. Especially as I dive into more photography. Great article. I agree on the windshield, especially the clammy part, but I have to share something that changed my life: the wind vest! I do a lot of backcountry skiing and mountaineering, so wind at elevation becomes an issue. But they are high exertion activities, so a full windshirt is way too much. But the Patagonia Houdini Vest weighs nothing and cuts the wind right where you need it while still letting you dump heat. When you’re bringing ALL your winter layering pieces (puffy pants, rain pants, winter weight sleeping bag, etc.) are you still fitting it all in the HMG 2400 Southwest? Which pack do you recommend for the added weight/volume when including your warmest layers? In your winds pic it looks like you have a vest on over a shell. Can you elaborate on those brand pieces and why that layering scenario was chosen? I just stumbled on your site the other day and am amazed at the breadth and depth of your blog concerning backpacking and especially the UL end of the spectrum. Anyway, awesome site! I just tried out the layering system you suggested and ditched my 2 oz wind jacket for a 7 oz fleece. Now, I am a diehard wind jacket guy, so it was with some trepidation I set out this AM on my usual 10 mile training hike without said wind jacket. It was between 36° and 40° F over the course of my trek with calm winds here in Eugene. Humidity in the 90% range. I was slightly cool when starting, but nothing too bad. 2 miles in I start up a 10% grade. I got ready to sweat like I almost always do, but it never really happened. Usually by the time I get a quarter of the way up this mile long hill I have to stop and strip down. (Cue chill factor), but not this time. I did the whole 10 miles without a pause to take off or add clothing. A first. So I am cautiously optimistic that I have found a new, albeit heavier, layering system. Thanks! Your website has been a fantastic information resource, and I definitely have run into the same problems you have trying to find lightweight fleece. I think north face is continuing to make their lightweight, but I think they average out the weight across the whole line when they put a stated weight and they sell a XXXL! That’s a lot of fabric! Anyway, I was curious if you’d ever tested any of the lightweight Mountain Hardwear gear outside of the Ghost Whisperer jacket? I found one on sale for $170 and picked it up because it was a steal (no hood, but at that price I didn’t care). However, when I was looking at the Ghost Whisperer jacket I came across a few other items that seemed like they would fit nicely into your systems. The first being the Mountain Hardwear Supercharger Shell. https://www.sierratradingpost.com/mountain-hardwear-dryq-core-supercharger-jacket-waterproof-for-men~p~306jx/?filterString=s~supercharger%2F#sizingSection On sale for 79 bucks and 6.1 oz claimed weight! Heck of a deal. Curious if there’s anything you see glaringly wrong with it. However, there’s nothing unique about it notwithstanding the current price to weight, but it could very well be not that great of a product. The second is a more intriguing item. It is the Microchill 2.0 Zip T. https://www.mountainhardwear.com/mens-microchill-2.0-zip-t-1677261.html?cgid=mens-tops-fleece&dwvar_1677261_variationColor=011#start=1 Normal price of $55 and a claimed weight of 5.9 oz! If this has the same properties as a normal 100 wt fleece, but is just 2 oz lighter and the same price as TNF lightweight fleece, I think it is something worth looking into. Added benefit is it’s a full half zip for better venting! Curious about your thoughts on this product. I like the Microchill hoody I picked up, but the weights listed on Mountain Hardwear’s website are completely off. They say 4.8oz for the full zip hoody, it weighs more like 10.7oz. But functionally it’s great – handwarmer pockets, full zip, hood, and it’s light/thin. It doesn’t stop wind as well as the TNF TKA 1/4 zip I have, but provides more coverage. Hood is cavernous and does not have drawstrings/adjustment, so Patagonia Hoody may be better bet in Alan’s system. Website describes it as “perfect as a base layer, wearing as a light standalone pullover or for added warmth under a shell.” I concur – I love this with my Montbell Tachyon Anorak wind shirt (2.3oz), only pulling out the wind shirt at the very beginning of hiking or when it’s super windy. As noted, a slightly different system than what Alan’s using, and heavier overall. Saves wear and tear on my rain jacket also. the approx. 10 oz Pat. Men’s Nano-Air Light Hoody or Men’s Nano-Air Light Hybrid Hoody. They might be the perfect blend of warmth, moderate wind resistance, and breathability (you can easily breathe through the shell). Or even the OR Ascendant Hoody at ~11.5 oz. I’m sorry man, maybe it’s because I’m not a native english speaking user or something, but I find these threads so confusing! I do not understand the rules you are suggesting. For instance: I will go to the Alps again this summer, it’s like 20°C in the sun, even more, and -5°C° when it’s night and it’s cold. Wind is always there, sometimes it rains too! I’d like to semplify my gear and equipment, and I believe I can carry a shor sleeve T, a Patagonia R1 and a 100g ultralight windjacket (wind and very small rain – jacket) . My worry is regarding maybe a down vest, no hood. Sorry for the confusion Andrew. I am guessing that the fairly technical/complex topic does not translate easily to other languages. You have an excellent Q about environments that range from moderate (room temperature) temps to very cold (below freezing) with some rain thrown in: I would say a short sleeve, or long sleeve T (or a thin base layer), a Pat R1, 3 oz wind shirt, a rain jacket would be a good set of active layers. And then add to that a warm down jacket with a hood. Something in the 300g to 400g range with a very light shell fabric. Take a look at my Guide to Lightweight Down Jackets and Pants for Backpacking. In Europe it might be easier to get a jacket like this from Rab or Montane, etc. My preference is when I moving I’m moving. And when I’m stopped, I’m stopped. Or put in other words, the down jacket is only for when I am stopped. And then I want it to be very warm. Just a few more oz down can make an incredible difference in warmth. Oh, and if you could find a denser weave (less air-permeable than the R1) 100 wt fleece you might be able to ditch the wind shirt. Not for the weight savings but for the time saved in layer changes. I and a number of my experience friends feel the denser weave 100 wt fleece had a broader comfort range (less layer adjusting) than a the combo of a more air-permeable fleece and a wind shirt. I will note that some other very experienced hikers don’t agree about this. That’s great, clear now…thanks Alan. I actually meant a light vest OVER a fleece, not instead of it. So baselayer + R1 + vest + rain jacket would be the system. I think the vest in this system represents an extra layer compared to your overall recomendation ? a 100 weight fleece like TNF TKA 100 Glacier 1/4 Zip Pullover or White Sierra Alpha Beta Quarter Zip (100 wt) both at Amazon or if you can’t find a 100 wt fleece use a Pat R1 garment. And then a light rain jacket. To be used for rain obviously. But also as a windshirt if it gets cold and windy. This is where the more wind resistant 100 wt fleece shines as means you can wait longer until having to put the rain jacket on. Informative article, I’m sure it has shifted many people’s paradigms. I hope try some of the ideas out very soon. One item though for me that’s become integral to my 4 season list is the Squamish wind jacket…the reason is b/c it breathes better than any other and allows me to find that sweet spot to prevent chilling but allow drying. Last spring in March used it, a craft base layer, & a smart wool mid at the summit of Kirkwood ski area in 40mph winds @28deg. Alan, thanks for the time you put into this site. Would you discuss the footwear you use when you expect colder temps with rain or snow? I’m usually in the Sierras in late September to early October and often see some precipitation. Can your feet stay warm walking in all day rain when it’s 35-45? And what do you recommend when you arrive in camp with wet feet and aren’t planning to jump right into the bag/quilt? Thanks Alan I enjoyed this. I share your liking for fleece. It went out of fashion for a while but I always carry a 100wt fleece on backpacking trips, so versatile! Great article. And it can’t be emphasized enough that with proper layering, you should start cold in cold weather! That is, you shouldn’t dress to be warm when you’re standing still at the beginning of a hike (lots of people make this mistake). You need to learn how to deal with being cold for anywhere from 20-40 minutes of activity before your body kicks into “high heating mode.” It’s never fun, but you get used to it—and it pays off in the long run. Is there a benefit to having Insect Shield applied to fabric that bugs can’t bite through regardless? I’ve had 2 or 3 RailRiders shirts treated with the stuff and have seen hordes of mosquitoes land on the shirts and walk around for several minutes in search of a place to try and bite through, and eventually fly off. I’ve never seen one drop dead yet. Maybe some of them eventually die, but the Insect Shield doesn’t deter them from landing on me. The shirts are some kind of nylon/poly blend I think, and since the bugs can no more bite through that than they can my rain jacket, is there an advantage to having it on there? I used to wear pants with it and witnessed the same plague-like congregation of skeeters landing all over them. More recently I switched to the somewhat stretchy and more comfy Prana pants with no Insect Shield and find zero practical difference. The bugs still land on me, but they can’t bite through the material. My approach in the High Sierra in bug season is to just keep covered with lightweight, tightly woven nylon or some kind of blend that the bugs can’t bite through so that my sun protection and bug protection are essentially one. Works really well. I just can’t figure out what I’m missing. Hi Randy. Apologies for the late reply. Somehow this slipped off of my screen before answering. First, I have had good success with clothes that mosquitoes can’t bite through. Especially places like the sierras where intense mosquito pressure is rare. And even then it’s fairly local and they usually shut down after dark. This is a different story in places like Alaska at Summer Solstice where they will eventually bite through anything you can tolerate to wear in warm weather. There permethrin pants and shirts do matter. And in a place with malaria or yellow fever (not the US) then everything you can do to reduce mosquitos bites is critical. Second, unless you seal all your lower extremities, ticks in spring on the East Coast are much more of a worry. They can crawl in the smallest of openings. Here I would definitely use permethrin pants or at least coat my legs in picaradin–maybe refreshing the treatment midday. Thanks for the reply Alan. I used to live back east, and ticks were far more of a problem. I’ve literally seen only one tick in 5 seasons of Sierra hiking, but I’m always up high. Haha. The odd thing about my treated Railriders shirts was that I had very few washings at all on them. Perplexing. Thanks again for the reply, and keep up the awesome work on the website. REALLY valuable stuff! One note about permethrin – it is extremely toxic to cats. I never see that mentioned in gear discussions, but if you have cats at home bear that in mind. Great article, thanks! The trick with layering is that the whole becomes greater than the sum of its parts, and your building block approach is ideal.